If you have data in Funnel in more than one currency you have two options for converting this data to a common currency. You can either set the conversion rates manually or let Funnel do this for you. Having Funnel automatically convert currencies is the default option so you don't have to do anything to enable it. The rates are fetched from openexchangerates.org and set on a monthly basis. The currency converter fetches the exchange rate the first day of each month and uses that for the remainder of the month. This keeps your conversion rates in Funnel stable and avoids having values changing over the course of a month. 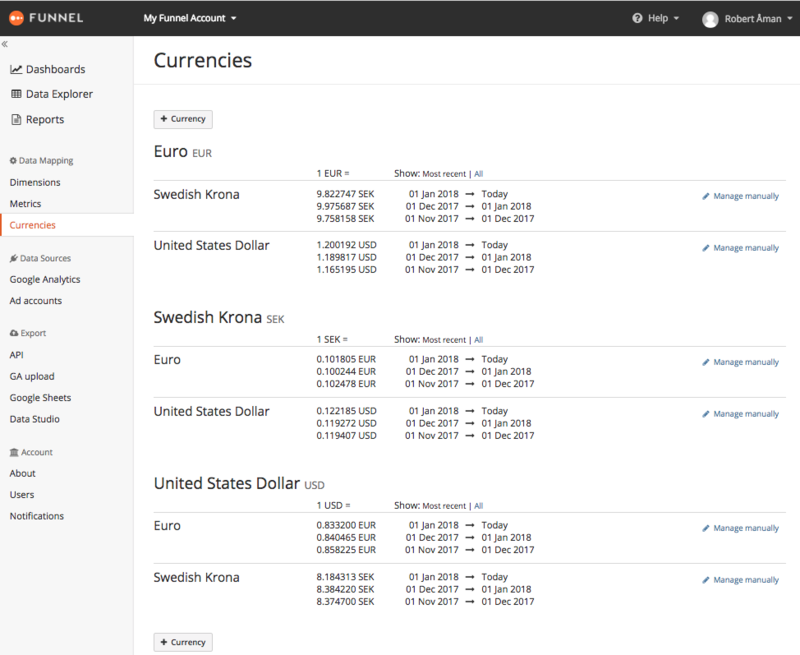 The currencies listed on the currencies page are those used by your connected platforms. Should you wish to view your data in any other currency, you can simply add it and rates conversion will be handled automatically. If you want complete control of your conversion rates manual handling is the way forward. Set your conversion rates on a monthly basis, and update them as the rates change. For example you might do this for a single currency, and let Funnel handle the rest automatically.